No, let's try this again. Can you guess the answer? What Am I? 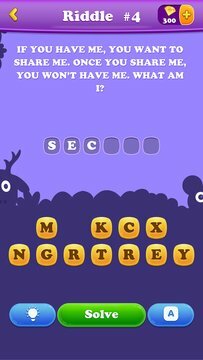 Riddles with Answers is a guess the word game you are simply going to get addicted to. Make your brain work a percent or two better and solve those clever tricky riddles! This classic brain teaser riddle game for kids and adults is definitely going to make you cry! No, just kidding, but it will be a nice mental workout. Download What Am I? Riddles with Answers game and enjoy your new pastime hobby! Riddles with answers have always been popular among both kids and adults, and what am I games are No. 1 when it comes to puzzles. Some people say that guess the word games such as tricky and difficult riddles make your brain work faster and therefore your IQ raises. Well, we can't be sure about that, but we can guarantee you that solving clever riddles will make the time fly. Move the borders of your imagination and expand your logical thinking; that will lead you to the correct answer. Wanna find out the answer? Download What Am I? Riddles with Answers and discover the solution! You will enjoy the search, that’s for sure. What Am I? 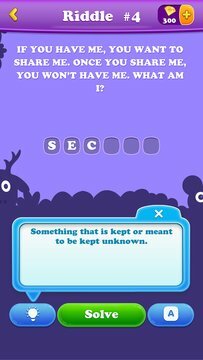 Riddles with Answers game is an intellectual property of Peaksel.